We depart Knoxville traveling west through Nashville and Memphis entering Arkansas and continuing to Conway, Arkanas for our frst overnight stop. Leaving Arkansas,”The Land Of Opportunity”, we make our way to Oklahoma, “The Sooner State”. Our overnight stop will be Oklahoma City, where on a single day in 1889, it became a city of 10,000 people. We will visit the National Cowboy and Western Heritage Museum Center—a national memorial to the men and women who pioneered the West. An extensive collection of Western art, historic artifacts and exhibits of American Indian and pioneer life in realistic settings is on display. We also visit the Oklahoma City National Memorial; a memorial in the United States that honors the victims, survivors, rescuers, and all who were affected by the Oklahoma City bombing on April 19, 1995. Standing along Route 66 west of Amarillo, Cadillac Ranch was invented and built by a group of art-hippies imported from San Francisco. We will see a big change in the land today before we reach Albuquerque making a brief stop in Old Town where Albuquerque began. You will see the adobe type buildings which were frst used when the Spanish arrived. Overnight accommodations await us in Albuquerque. We continue through New Mexico crossing the Continental Divide near Gallup, New Mexico. Just past Gallup we enter Arizona at Window Rock, a small city that serves as the seat of government and capital of the Navajo Nation. It lies close to Monument Valley, Canyon de Chelly and Four Corners. Kayenta, Arizona is our destination for the night. This morning we have a short drive to Goulding’s Trading Post in Monument Valley where we board jeeps for a tour into Monument Valley. Immense mesas, buttes, and pinnacles of raw sandstone rise like phantom ships on a silent sea. Precarious spires, and domed rock formations of reds, oranges, and yellows shine brightly against a brilliant blue sky. A million and a half years of weathering have worn away huge amounts of soft rock, leaving these monoliths with their erosion-resistant caps of DeChelly sandstone. Lunch is included at Goulding’s Trading Post We will stop along the way at roadside stands where Native Americans sell jewelry, pots and samples of Navajo fry bread. We continue to the Page/ Lake Powell area for the night. Page, Arizona is home to the Glen Canyon Dam on the Colorado River which forms spectacular Lake Powell. Today will be a long remembered highlight of our tour as this morning we travel to the North Rim of the Grand Canyon. Whatever you might have expected, you just won’t be prepared for what you will see as endless oceans of color spread to the far horizons in ever changing waves of gold, crimson, blue and lavender sandstone. After lunch we depart northbound across the Kaibab Plateau to Springdale, Utah for a two night stay. Springdale is located just outside Zion National Park. We enter Zion National Park and travel Zion Canyon Scenic Drive as it cuts through Zion’s main section, leading to forest trails along the Virgin River. The river fows to the Emerald Pools, which have waterfalls and a hanging garden. The Mormons called this spectacular outdoor wonderland the “Heavenly City of God”, because its massive formations of extremely vertical rock looked like huge cathedrals and thrones. Lake West Temple rises to 7,795 feet and one of the park’s more noted landmarks, the Temple of Sinawava, is a natural amphitheater surrounded by pink cliffs. After lunch (included) at Zion Lodge and touring the park we return to Springdale for the night. The beauty you will see today is beyond description. While standing on the edge of Bryce Canyon you will see some of earth’s most colorful rocks. Bryce Canyon National Park, located in the Dixie National Forest, though smaller than Zion, has its own brand of unique beauty featuring weird looking formations known as hoodoos. From the rim drive, the oddly shaped rocks and cliffs resemble castles, animals, people, and houses. You will see how the rain, snow, freezing and thawing have formed fantastic pillars of rock which look as though you could topple them with a push of the fnger. After a full day of sightseeing in the Canyon we return to our hotel for the night. We depart Ruby’s Inn, traveling north crossing a desertscape of twisting canyons and upthrust rock along the Grand Staircase—Escalante National Monument to Torrey for our morning break. 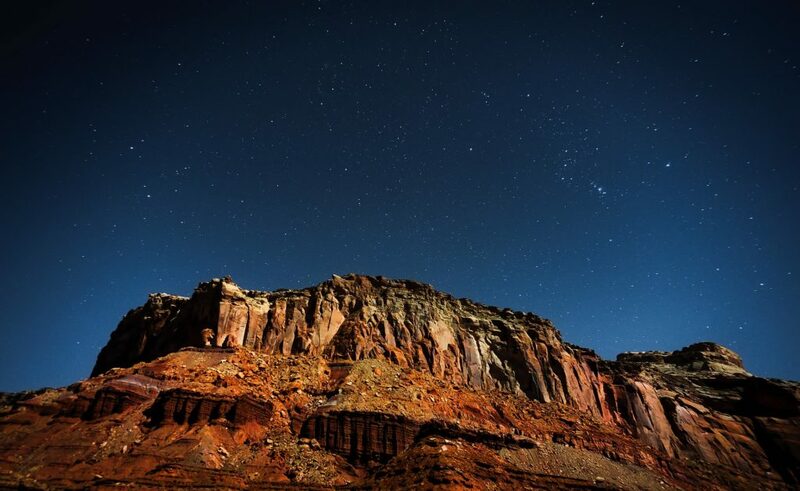 We continue to Capitol Reef National Park. The Navajo call it the Land of the Sleeping Rainbow—a strange, beautiful landscape of multi-hued rock layers. The park’s name comes from Capitol Dome, a white sandstone bulge shaped like Washington DC’s Capitol. We will enjoy a delightful picnic in the park. We continue along Highway 24 to Interstate 70 to Crescent Junction where we take US 191 south to Moab— on the banks of the Colorado River, nestled in a fertile green valley between soaring red sandstone cliffs. The town of Moab is truly an emerald in the desert and is the mountain biking capital of the world. 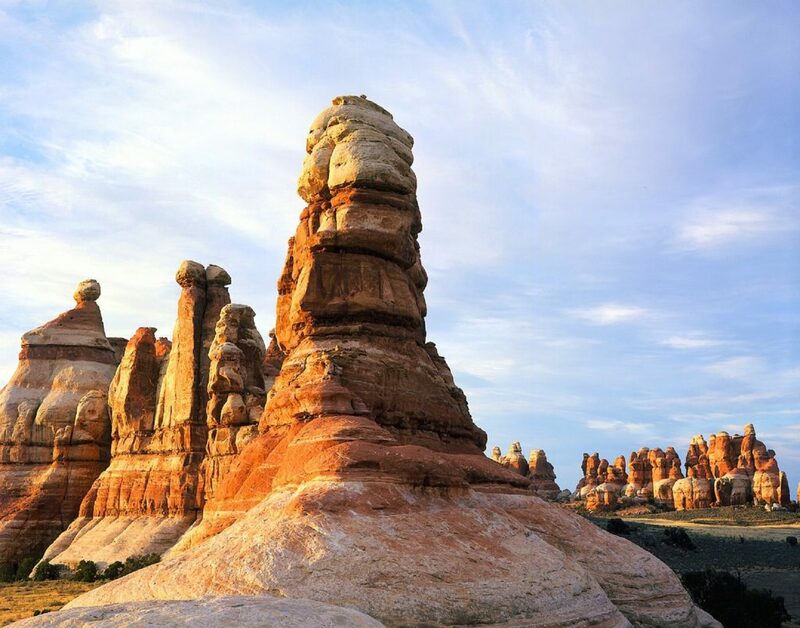 Its a short drive from Moab to Arches National Park—a timeless natural landscape of giant stone arches, pinnacles, spires, fns and windows that was once the bed of an ancient sea. The power of erosion has laid bare the skeletal structure of the earth in Arches National Park. Shortly after exiting the park we enter the state of Colorado with scenic views of the Colorado National Monument —an area seamed with canyons more than 600 feet deep formed from the effects of erosion. At Grand Junction we travel south on famous Highway 50 through Delta to Montrose, Colorado, for overnight. We continue east along the Black Canyon of the Gunnison National Monument, famed for its narrowness, its 1,730 to 2,725 foot depth, great expanses of sheer rock granite walls and rugged gorge formations. Incorporating 12 miles along the deepest portion of the Gunnison River gorge, this is one of the most amazing sights in the country. Although there are other canyons that may be deeper, longer, or even a bit narrower, none combines so many extraordinary features in such a small area. The product of more than two million years of cutting action by the river, the canyon reaches a maximum depth of almost 2,700 feet below the rim. We continue to Cañon City for a stop at the Royal Gorge of the Arkansas River—the world’s highest suspension bridge, which rises 1,053 feet over the Arkansas River. We continue to La Junta Colorado, for the night. This morning we continue along Highway 50 to Dodge City, Kansas. Named after nearby Fort Dodge, the city is famous in American culture for its history as a wild frontier town of the Old West. Wyatt Earp and Bat Masterson both made their reputations here during the city’s rough and tumble heyday during the late 19th century. Head to the Boot Hill Museum, a living-history reconstruction of Dodge City’s notorious Front Street in 1876. In the Trail of Fame walking tour see famous and historic western fgures memorialized including Wyatt Earp, “Bat” Masterson, of “Doc” Holliday, and “Big Nose” Kate Elder to name just a few. The centerpiece of the Dodge City Trail of Fame is the larger than life 9’ bronze statue, “Wyatt Earp, Famous Dodge City Lawman”. Experience gaming in historic Dodge City in a state-of-the-art facility designed to recreate the feeling of the elegant old west—The Boot Hill Casino. We spend the night in Dodge City. We travel across highway 50 to Hutchinson, Kansas located on the Arkansas River northwest of Wichita. It has been home to salt mines since 1887, thus its nickname of “Salt City”, but locals call it “Hutch”. The Kansas Underground Salt Museum is built within one of the world’s largest deposits of rock salt. It provides the opportunity to go 650 feet beneath the earth’s surface. There are just 14 other salt mines in the United States, none of which are accessible to tourists. After lunch (included) in Hutchinson, we continue to Kansas City, Missouri, for overnight. If there was a tour for you to take pictures and more pictures—then this is the one! The scenery is so magnifcent that it will be impossible to capture it all on flm. It has truly been another Knoxville-tourifc vacation.